The year is 2061, and the planet is dying. Cataclysmic solar storms have forced leaders from around the world to finally put aside their differences and agree on one thing--to jump ship. The human race is headed to Mars. Dr. Sophie Winston is hired by New Tech Corporation to test a biosphere deep within the heart of Cheyenne Mountain; a mission she believes will help prepare the company for the three-year flight to the red planet. But, just days into the assignment, things start to go wrong. When the blast doors hiss open, Winston's team finds a changed world outside. Humans are gone, vanished without a trace, and they aren't the only thing missing. The planet's water is gone, too. 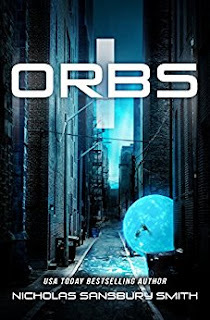 As the team explores their surroundings, they find thousands of luminous blue orbs lining the streets. It isn't until they uncover what's inside that they realize the nightmare that lies ahead.